The representation of space within Western visual cultures has evolved from a mathematical (re)construction of our three-dimensional world, based on systems of linear perspective and Euclidean/Cartesian theoretical models of space. As a historical lineage, 3-D CGI emerges as a distant relative of Quattrocento image-making systems and is forged from (and privileges) the perspectival conviction adopted by Western visual and cultural ideologies, which in turn continues to understand space as objective (i.e. measured and metric). For example, it’s essential relations are with photographic media whose methods are honed to assume a position from which to command and manipulate spatial relations and it is in this way that the narrative, the function and the basis for 3-D CGI image-making is framed. Therefore when we conceive of the image produced by 3-D CGI we are at the same time measuring its cultural position and its location within this heritage. By extension, when referring to 3-D CGI we might consider our system for understanding visual space as linked to and assimilated from that of film and photography (which itself embodies a codification system for establishing space and spatial relations predominantly based on an objective understanding). This interconnection between objective understanding of space, perception and the mechanisms for the manufacture of visual space is a subject that is explored in Stephen Heath’s thesis Narrative Space, in which he discusses an absolute relationship between the camera (including its associated paraphernalia; lens, projection, film etc.) and space. For Heath it is the spatial construction that binds space to frame and space to narrative that qualifies an inextricable relation between space and film. Within 3-D CGI I posit that the complexity of this relationship is more profound, further integrated and increasingly irreducible. If in our consumption of the 3-D CGI image we add to this mix the additional perceptual complexities associated with a supposed camera and also that of film space within 3-D CGI and include a further dimension offered through multi-screen and image-object, as well as the spatial potentials between image and viewer, then it becomes a complex visual and intellectual system where at its centre is the concept of space. It is against this backdrop that this paper takes the first step in the proposition that space can be considered as the leading material quality of 3-D CGI animation. This research presents the idea that animation work produced using 3-D CGI is primarily spatial and that it conforms to two dominant (general) spatial theories: one that is determined by objective or relative space theory and one that is informed by subjective or perceived space theory. My hypothesis suggests that the integration of both sets of theories within the production of 3-D CGI animation is fundamental to and provides a basis for exploring the application of space as a material mode within this medium. Moreover the aim via this research is to state the case for subjective space as a leading alternative to communication solutions within 3-D CGI—thus opposing what might be considered the current dominant approach to 3-D CGI animation, one that is largely based on the understanding and application of objective space. The ambition of this paper is not to establish a meaning for space, to provide a definition of space or to discuss perceptual mechanisms for processing space. Instead the work utilises and references various debates surrounding these topics to inform an investigation into a potential materiality for 3-D CGI where the aim is to invite a discussion around the role of space within this specific mode of production. To investigate these ideas a series of animation works were produced and exhibited at venues such as the CUC Gallery in Liverpool, The Hockney Gallery in London and Museum of Science and Industry in Manchester (MOSI). The work sought, through practice and process, to understand more directly the relationship and the role of space within 3-D CGI production and to consider space as material. It borrows from and refers to methods and principles of Structural/Materialist film developed by Gidal and Le Grice circa 1960/70. fig. 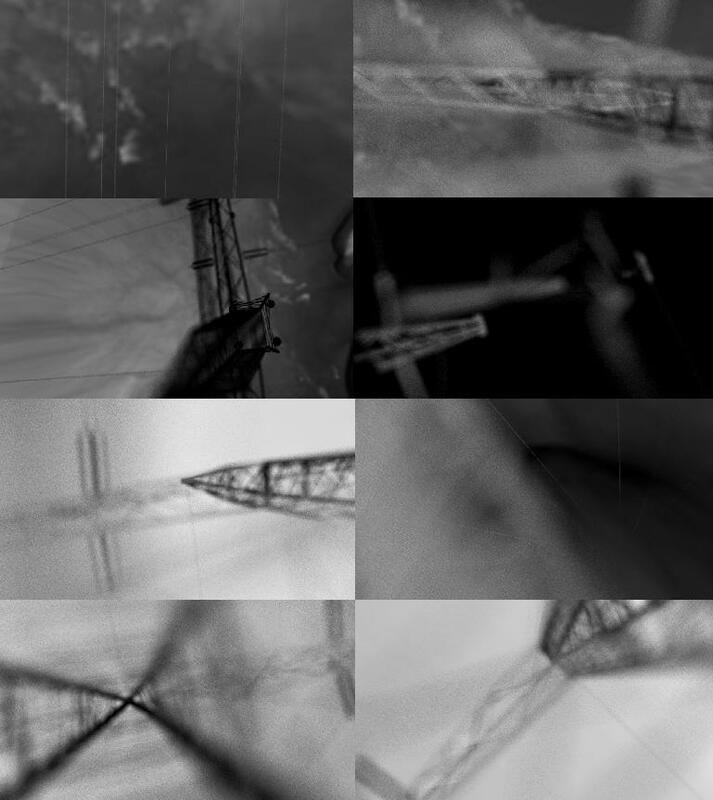 1 Rendered images from Pylons: Up/Down (2011) ~ An example sequence from a series of animation tests designed to examine relationships between the virtual camera and an arbitrary object. This paper outlines one of the works from the animation series Pylons 2 (2011) as a means to support the claim that space can be considered material. The emphasis in the work was to establish the virtual camera as possessing the ability to discuss itself within a supposed (3-D CGI) film context, and that in turn this might provide potential avenues for exploring space and its materiality. fig. 2 Rendered images from Pylons: Up/Down (2011) ~ A second example sequence from a series of animation tests designed to consider the act of the camera as active. fig. 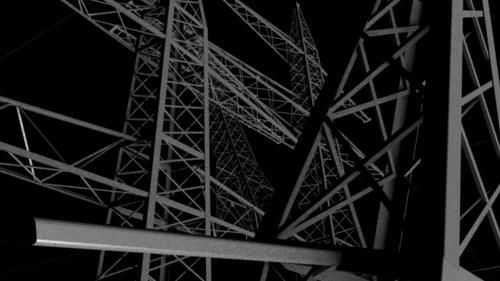 3 Experimental render images from Pylons (2011) ~ Examining alternative set-ups and configurations. Experiment 2: Pylons 2 ~ October/November 2011. The camera as instigated and discussed in terms of its subjective and objective relationship with the profilmic event. By extending this concept to include the viewer as author and the activity of viewing (as maker and viewer), the work proposed to explore and question the role of the viewer as integral to the work and our understanding of its process. Therefore the relationship between the viewer, the space (of exhibition), the camera and the profilmic (the space in front of the camera) were at the forefront of this enquiry. Through introducing the camera as key component with its own remit (as a camera), is it possible through opposition (via image juxtaposition) to gain a more developed insight into the potential of the virtual camera and to reflexively review its own process? Can we comprehend the virtual camera as a device to interface and record a virtual environment? How might such an idea be developed via a virtual camera and deemed for its ability to capture and record? Screen-reliant installation artworks such as filmstrip/soundstrip self-reflexively foreground the viewer-screen interface in a way that tends not to occur in mainstream narrative cinema or even in experimental film. Film in Sharits’s locational environments/installations is exposed as a material process and presented as an environment: film is considered to be a space. This space is made up of immaterial projected images but also the physical apparatus; the screen, film, the projectors emerge as sculptural objects in their own right. At MOSI the association between object and the presentation of space intended further influence through the use of monitors and their positioning within the physical/actual environment of the exhibition space. The work consisted of three monitor screens and an additional, single projection. 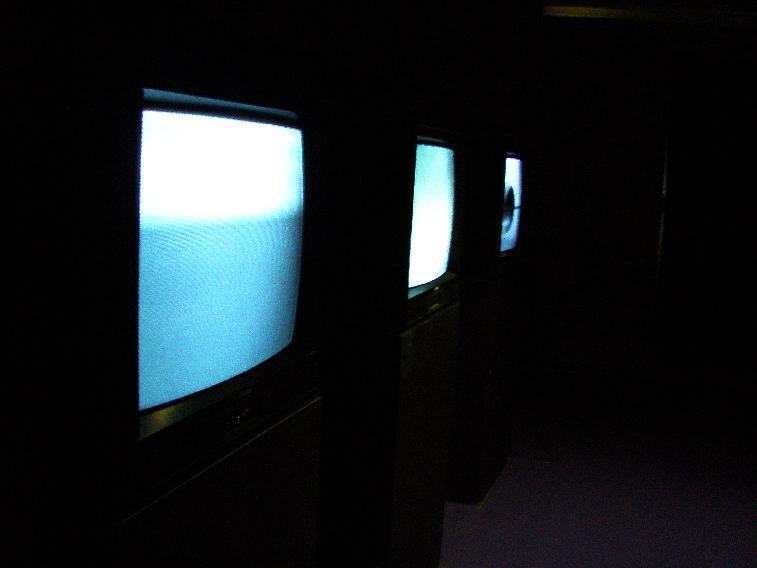 The three screens were designed to operate and to be viewed simultaneously with the purpose that the viewer would conceive of the three screens (and the single projection) as a distinct, phenomenological experience. The proposition for the installation was to generate opportunities where the viewer can engage with the work on different perceptual planes both subjectively and objectively. For example, the images and the screens represent virtual and physical (actual) objects as measurable, tangible entities. Concurrently, the images and the exhibition space itself, within which the images were shown, was intended to be perceived in non-metric, subjective terms. The intention of screen  was to present an unfixed, indeterminate landscape (providing a subjective aesthetic), within which the camera travels in a constant horizontal, linear motion. fig. 4 Rendered still sequences from Pylons 2 (2011) ~ Landscape oriented animation designed to assimilate horizontal movement. The image in this screen was designated as an active subject and the motion and direction of the camera was as a means to counter any perceptual interest in a supposed depth of the image, moving along the horizon, never entering into it. fig. 5 Rendered still sequences from Pylons 2 (2011) ~ Landscape oriented animation designed to assimilate horizontal movement. In contrast, screen  offers a vertical comparison to screen ’s horizontal orientation. Whereas the purpose of screen  was to present the viewer with an indeterminate screen space (where the subjective scale was directed at a supposed, individual, distant horizon), screen  was conceived to lead the viewer to consider a subjective space that is much closer to the camera in terms of (supposed) pro-filmic distance. The camera in screen  was animated to provide the viewer with an alternative perception for the imagined camera’s movement. fig. 6 Rendered still sequences from Pylons 2 (2011) ~ Portrait oriented animation designed to assimilate vertical movement. For example, the camera could be deemed as either travelling vertically (traversing a static object), or it might be seen as a static observer, with objects falling past its lens. The remit of screen  was for the space within which the objects are situated and for the objects (scale, material, size) to remain ambiguous and to act as a possible mechanism to encourage the viewer to consider and review screen space/camera relations. The arrangement for the third, final animation, screen  provided a virtual, static camera that was positioned before a rotating object. The object was intentionally arbitrary and the image provided no clue to position or distance within its landscape. Screen  differs from screens  and  insomuch as the object presented as a focus for the camera is an identifiable object (an anemometer). The intended association for the object is one that is recording and measuring an implied physicality. A (paradoxical) measuring device was introduced, an instrument for capturing and recording wind speed (anemometer) placed within a virtual environment which is itself devoid of physical or environmental stimuli. fig. 7 Rendered still sequences from Pylons 2 (2011) ~ Object oriented animation. Additional Projection Screen ~ A projector was placed in the ceiling space within the exhibition area where it was positioned to point towards the floor. 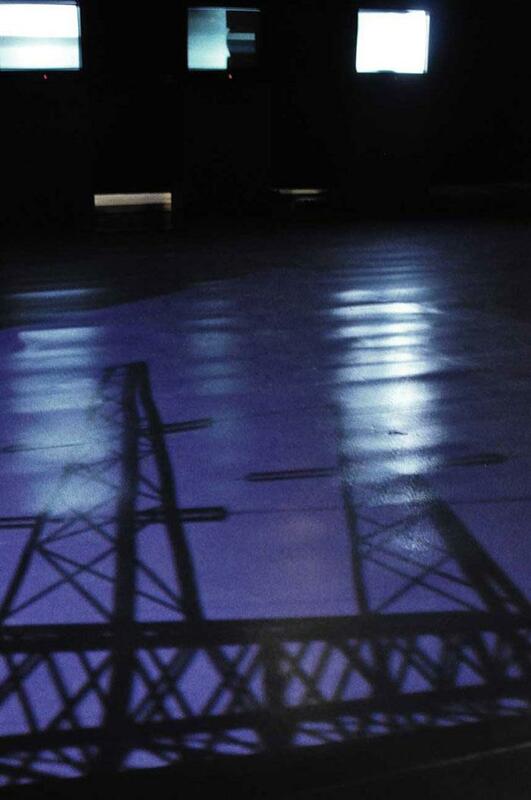 The projected image consisted of a pylon silhouette that gradually shifted its position across the exhibition floor. fig. 8 Photos taken at the installation site at MOSI, Pylons 2 (2011). fig. 9 Image taken at the installation site at MOSI, Pylons 2 (2011) showing floor projection. fig. 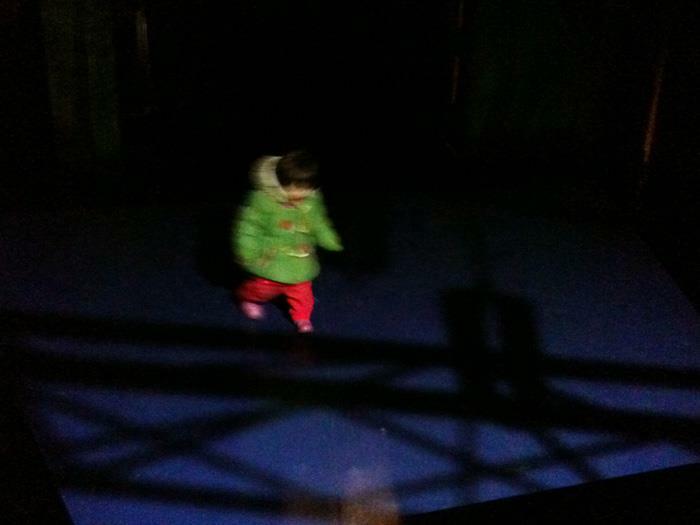 10 Image taken at the installation site at MOSI, Pylons 2 (2011) showing floor projection. Conclusions relating to the exhibition were collated through meetings with peers during the installation, and also via self-reflection during and as a result of the activity of exhibition (practice of practice). Pylons raised an interest in two key areas: questions about the role of the virtual camera including concepts of ‘recording’ and ‘process as instituted as process’; and questions about how we interface with the spaces that the virtual image produces, its mode of presentation and consumption. (1) Capture and Process: In the virtual domain, when we consider process establishing process through pro-filmic devices, there is an ambiguity around the role of the camera, the notion of the camera and the relationship between camera and what we might conceive as pro-filmic in the virtual world. The virtual camera (as discussed via Pylons) is integral to the production of the virtual image but has in many ways (seen through this research) a greater role to play as mediator between image (what might be considered as filmic) and the pro-filmic than it does in a traditional camera set-up. A virtual encounter between a simulated camera and virtual light acts to mimic the properties of a real encounter, whatever the parameters of the virtual camera may be; however, because this encounter is virtual, it offers the possibility for cameras whose functions are impossible in the physical world; the dynamics of encounter between virtual sensor and virtual light can also be modified in ways inconsistent with physical reality, and can even violate the laws of physical reality if the programmer chooses. The digital variants of this pairing become apparent through CGI. Digital imaging either simulates the optical effects of cameras, or it alters the image graphically as a two dimensional construct. In Pylons the attempt to incorporate the viewer in the idea of process and to instil a direct relationship between viewer and the image, as well as between image, viewer and process, has imbued the research with other dimensional possibilities. It has led to questions about subject and object and about the spaces that are formed as a result of these precepts. (2) Space as Material: The animation work reinforces the initial premise for this project was to seek a materiality for 3-D CGI. Capacity for simultaneous multi-projections needs to be built into the compositional space and many problems remain to be solved with such systems. However, the seamless integration of multiple perspectives with appropriate lighting, shadows and effective artistic control may provide a projection palate freed from the hegemony of the quasi-objectivity of perspective, enabling the animator to choose dialogically what aspects of the scene to accentuate, from what angle and to what aesthetic effect. It is the liberation of 3-D CGI from its linear perspective-driven perception and visual culture conditioning that forms the basis for my most recent thinking in terms of space and the relationship between space and 3-D CGI. How space might be discussed and contained as a subject is the focus for the remaining section of this article. Space theories exist across disparate lines of enquiry and discrete disciplines many of which, as areas of specialism, insist on a knowledge of spatial concerns as central to subject understanding. For example, Social Sciences, Mathematics, Philosophy, Fine Arts and Architecture each depend on an engagement with space as an active dimensional component that connects research to application. Space in this way represents a functional primary resource and a critical dynamic force. Yet space as an entity often evades singular definition. It can be about, and at the same time connected to, a range of academic, intellectual, philosophical, relative, physical, and abstract pursuits within a single subject area. Its application draws in a breadth of ideological and practical usage, not least 3-D CGI animation, and space can be considered a common element binding both related and independent areas. We are hemmed in by the three dominant ways in which space is rendered: (1) Space as a Newtonian conceptualisation where it is seen as a category equal to time, thus allying geography to history. Space here is the solution to the question: the interaction and integration of phenomena is explained in terms of space. In other words, space is the container for action – Kant’s filing system for observation – an abstract frame of reference independent of matter; (2) More simply, and more commonly, space is understood as a relative, but active, term. Here space is a material reality dealing with questions of scale – space as a plane, as a distance, as something that acts as a weak actant and has effect; (3) More open to possibility but often just as constraining in how it is conceptualised, space is turned into something that is relative to the transcendent. Space is a product of society but also a factor in the production of the social becoming socially constructed, idealised and ideological. Demonstrating that the question of space can provide not one, but multiple dominant spatial definitions within an individual specialism. Equally, each principle strand might be further expanded to increase key variations within the same primary topic. Space as a ‘product of society’, divided as such, delineates additional refinement of conceptual ideas; space as a product (a consequence of political, social, and economic activities); space as a process (referring to the coeval and relational nature of space); space as productive (where space emerges as a dynamic component shaping as well as generating change and directing social narratives). This is of course only one example and we might equally discuss definitions of space within the subjects of Architecture, Art or Mathematics with similar comparison. My point (through the above example) is to establish that multiple definitions of space occur, and are able to co-exist, within a single field of study. My conjecture therefore is that when space can be deemed a critical component within a subject one definition of space is not always possible or desirable. That it is the tensions, formed as a result of the differences between the opposing models, that facilitate and bind disparate ideas to form a unified and expanded knowledge of a discrete subject. It could therefore be argued that the dialectic of space itself operates to provide a more complete understanding or analysis of a topic or theme and that it is in the opposing or indirectly connected conceptualisations of space that serve to expand a unified knowledge or support subject ontologies. For example, for Henri Bergson this dualism exists in the tension between idealism and realism. That it is the relations between systems of science and perception that form the basis for an analysis of space. Two interdependent systems operate to mutually inform one another in order to adapt and confirm experience and understanding. The whole discussion turns upon the importance to be attributed to this knowledge as compared with scientific knowledge. The doctrine starts from the order required by science, and sees in perception only confused and provisional science. The other puts perception in the first place, erects it into an absolute, then holds science to be a symbolic expression of the real. But, for both parties, to perceive means above all to know. This in turn might be considered as an extended model derived from Kantian philosophy which introduces a distinction between the possible and the actual. Likewise this can itself be regarded as attempting to overcome a similar tension between the relative space outlined by G.W. Leibniz (space exists in its relative forms as material and immaterial) and the absolute space of Newton (non-dependent on physical events). It is the duality of spatial systems that are of interest here. Differences in the actual and the imagined, the material and the immaterial, the real world and the perceptual spaces. The idea of space as understood through polar conceptualisations and presented as unified systems, interlinked and interdependent. It might therefore be suggested that a dominant re-occurring trend within spatial theories is the dialectic between two polar spatial paradigms. An oft-repeated intellectual dualism between what might be broadly and simplistically regarded as imagined or visual space in opposition (but inextricably linked) to a physical or actual space grounded in perceptually real objects and distances. For example, for Hermann Soergel the fundamental substance of architecture is space and he distinguishes between “Daseinsram (existential space, the objective real, imaginable space), Erscheinungsraum (visual space, i.e. the physiological, visually perceivable space), and finally Wirkungsraum (effectual space, i.e. the aesthetically impressive space.” Although here Soergel alludes to three definitions, the important outcome from this analysis is his distinction between architecture as process (the technical and rational construction of the relationship between space and object) and architecture as art (the subjective and emotive realisation of space as concept), echoing Bergson’s delineation of subjective and objective nature of space and the interrelationship and inter-reliance between the two modes. A Relationist space theory, that places objective relationships at the centre of its discourse. Broadly, Relational theories adopt the viewpoint that space is related to physical, real-world or actual objects and the relations that exist between them. A Subjective theory, that might largely be seen as a development of Kant’s ideas as an extension of his theory of intuition and as a feature of his understanding the world around us as a priori. The final section of this discussion brings in objective and subjective combinations viewed through the work of David O’Reilly where the interplay of structure and ambiguity provide a harmonious conflict. If we look at O’Reilly it should be within his ideological approach to producing animation. The systematic and analytical method that he adopts to explore both the nature of the material of 3-D CGI which is through a defined set of rules that are designed to contain the animation practice as well as provide an aesthetic coherence to the work. “In 3d we essentially create artificial models of worlds, I contend that what makes these worlds believable is simply how coherent they are; how all the elements tie together under a set of rules which govern them consistently”. In essence it might be seen that O’Reilly’s work is more concerned with delivering a subversive narrative within an intentionally awkward, technically rudimentary style that he imposes as an aesthetic, and which he seeks to employ as complementary to the often abrasive and culturally challenging content of his animations. For example, in his work RGB XYZ part 1 (2008) he offsets the coarse verbal and narrative content against the coarse and deliberately crude treatment of his animation. O’Reilly discusses his approach as a method to deliver an economy of production, that the act of denying involvement in the complexities and refinement of delivering photorealistic animation (which he sees as inherent within 3-D CGI software), sets free the creative potential of the software and empowers the animator to explore more directly the expression of movement and codes for filmmaking. My short Please Say Something employed a very specific set of rules in its aesthetics. They are all centered around the idea of economy. One of the main problems with 3d animation is that it takes so long to learn and then to use, from constructing a world to rendering it. There are many knock on effects of this, mainly it prevents people from attempting to use it and employ it artistically, the process is very discouraging for the individual to go ahead and make their film. Simple changes can take hours to do, and very often the process is so rigid it doesnʼt allow any changes at all. The film makes no effort to cover up the fact that it is a computer animation, it holds an array of artifacts which distance it from reality, which tie it closer to the software it came from. This idea is in direct opposition to all current trends in animation, which take the route of desperately trying to look real, usually by realistic lighting and rendering, or by forcing a hand-made or naive appearance. This conceptual approach to filmmaking is explored further in other examples of his work, such as Black Lake (2010) in which the uncut camera leads the viewer through a cavernous water landscape where we are at once traversing the surface of the lake, following a family of ducks, we are beneath the surface of the lake, swimming with a school of fish and then entering into an ambiguous cosmic space, where we pass a small house. This sequence is looped three times, and with every passing cycle there is a peeling away of the visual surface to expose the geometric framework on which the illusion sits. 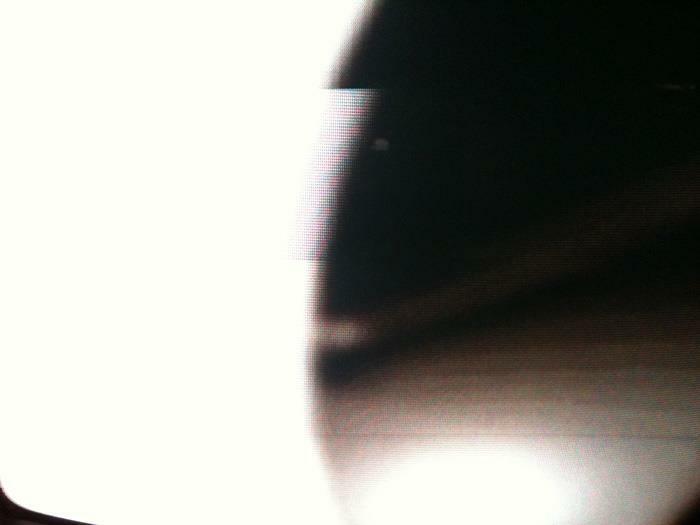 This cyclic deterioration of form and illusion to reveal process and material can be seen as reminiscent of the techniques and interests of some Structural/Materialist and experimental film/videos, such as David Hall’s This is a Television Receiver (1976) which follows a similar deconstructive trajectory that moves the viewer from one visual state of appreciation to then occupy another. In this way Black Lake might be seen as offering a unique description of 3-D CGI space. The film begins with the camera guiding the viewer through an ambiguous, subjective space within which the orientation and the boundaries of the space are unclear and where the darkness of the scene conceals visible limits and spatial referents. After the third pass, this offering of an indeterminate, subjective terrain is stripped away and replaced by an objective, linear perspective landscape, where animation paths, polygonal lines, and geometric planes serve to map the skeletal construction and to unveil previously hidden spatial relationships between objects and the environmental spheres. This understanding of space also characterizes a particular tradition of modern painting that stretches from Seurat to Giacometti and de Kooning. These painters tried to eliminate the notions of a distinct object and empty space as such. Instead they depicted a dense field that occasionally hardens into something that we can read as an object. The aim of this paper has been to discuss approaches to animation that develop and employ spatial aspects as a key component within their production. Moreover it has attempted to introduce a variety of different methodologies and practices that utilise or manipulate spatial techniques or conformities to deal with or assist in delivering central ideas within the work. Perhaps more importantly, this paper supports ideas that have been developed as a result of the project’s initial investigations, and that now, at this juncture, represent a step towards a refocusing of this research and a move towards a hypothesis that it is space that forms the basis for the material of 3-D CGI. The main intellectual and theoretical position relating to space up to this point in the research has been attached to the linage of representational perspectival systems of space from the Renaissance onwards. Departures from this specific theory, ideology or philosophy position, within this paper, have been introductory and presented as intentionally speculative. The investigation has been primarily concerned with an exploration into how space is included as a part of the experience and communication of an animated work and to what extent space might be deemed as a viable route through which to discuss material in relation to 3-D CGI. As a foremost principle, space is undeniably inherent in 3-D CGI and I have discussed this through the lineage of perspective as well as the variations that deviate from this system. A more philosophical stance has been where space is considered as a means to expand the relationships between image and viewer. In Pylons for example, image illusion confronts actual, real-world space to generate a phenomenological dialogue and to raise questions around indexical relations. Finally, by looking at the animations of O’Reilly, I have intimated that space can be viewed both simultaneously as objective and subjective within the same animated film, and in examples such as Black Lake we might consider the imagined and the actual, or the imagined and the illusion of the actual, as systems of representation, coexisting within the same frame. Underlying this research has been a direct reference to Structural/Materialist film and this has provided a practical basis for the study of digital materialism. It has supplied a useful framework from which to deconstruct a largely illusion-centric medium, and has been included as a fundamental component in the research methodology up to this point. It does however present a set of principles and a system designed to interrogate the medium of “film”. As such it is not without its shortcomings when applied to digital processes or dealing with and describing the complexities of a digital landscape. Most notable comparative differences are within the basic assumption that the function of the medium of film is to record experience. Film acts, primarily, as a process of recording and replaying ostensibly real-world experience and location. Digital 3-D CGI environments do offer-up and can present an equivalent spatial reality but this is a constructed, self-referential, reflexive geography. Perhaps more pressing is the possible limitations of Structural/Materialist as a methodological framework to discuss ideas of space. Space is an irrefutably large and complex subject and potentially beyond the boundaries of Structural/Materialist which is essentially an introspective system designed to study the material nature of film. Space as a subject is certainly included within Structural/Materialist discourse and many of the conclusions that have emerged in this project that relate to and have pointed towards space as material have emanated from this anthology. However, if the aim of this research is to determine the currency of space as material within 3-D CGI then an additional, robust method whose concern is more directly with problematizing space is required. To connect these theories and for the purposes of this study I lean towards Martin Heidegger’s theoretical stance and a recognition of space as including (but not imposing) two general theories of space. Consequently, Heidegger argues a third position that incorporates both subjective and objective viewpoints regarding space, one that involves our bodies in a lived space; both physical and perceptual. This forms the basis for my current research that explores Place and Space and key components in understanding space and its relationship with 3-D CGI. Patrick A. Heelan, Space-Perception and the Philosophy of Science (Berkeley and Los Angeles: University of California Press). Ivins’ text The Rationalization of Sight (1976)on perspective and the emergence of perspective within Western societies provides a comprehensive account. Visual space in this context refers to the space as perceived and understood by the viewer via perceptual means, predominantly visually. Stephen Heath, “Narrative Space,” Screen, Autumn 1976. For a useful discussion on image as object see Fried and his essay Art and Objecthood (1998). Also, the importance of extending the display to incorporate multi-screen experience lies in the juxtaposition of varying layers of profilmic landscape/object representations. Nicky Hamlyn, Film Art Phenomena (London: BFI Publishing, 2003). Kate Mondloch,Screens: Viewing Media Installation Art-Electronic Mediation(Minneapolis: University of Minnesota Press, 2010), p. 10. Peter Gidal, Materialist Film (London: Routledge, 1987), p.57. Michael Betancourt,Structuring Time (Rockville: The Wildside Press, 2004), p. 37. This might be seen as opposing more common attempts to define digital material through digital artefact and technological traces ‘glitch aesthetic’ or ‘glitch art’ theory (for example see Jonas Downey 2002). Pat Power “Animated Expressions: Expressive Style in 3D Computer Graphic Narrative Animation,”, Animation 4 (2009), p. 107. Henri Bergson, Matter and Memory (Mineola: Dover Publications, 2004), p.17. Paul Zucker, “The Paradox of Architectural Theories at the Beginning of the ‘Modern Movement’, Journal of the Society of Architectural HIstorians, Vol. X. No. 3 (Oct 1951), p. 11. David O’Reilly, “Basic Animation Aesthetics”, 2011, p.1. Further parallels might be drawn between O’Reilly’s work and Sharits, who modified the projector in his later work, or filmmakers using their fingers to create vignettes when shooting (See Hamlyn). David Curtis provides a useful insight into the work of David Hall and his series of film and video based experimental films (p 222). Lev Manovich in this context regards computer space as aggregate in that space in this sense is not continuous but formed of different spaces, across different networks and systems. Lev Manovich, The Language of New Media (Cambridge and London: MIT Press, 2001), p. 256-257. Manovich dicusses the paradigm of virtual space as being at a primitive stage of its evolution as opposed to being considered regressive and retrospectively reliant on ancient concepts of space. p. 257.